There are a few reasons why startups try to make a big splash in the press: they’re ready to start selling their product, they’re looking for partners or customers to test the product or they want to raise money. The last of those would be my guess why a battery startup called Alevo — with offices in Switzerland, a newly purchased factory building in North Carolina and a Norwegian entrepreneur founder — has decided to do a full-court press on the media for its coming out party this week. Alevo says that, for the past ten years, it has been working on a new type of battery made from lithium iron phosphate, and it was officially founded as a company six years ago. Alevo officials say their battery can be charged and discharged over 40,000 cycles, which is a very long life time for this type of battery, and they say their secret sauce is an inorganic electrolyte made from sulfur that significantly reduces the battery’s degradation over time. The electrolyte of a battery is the substance through which the charging and discharging occurs. Most batteries degrade over several years after hundreds and thousands of charging and discharging cycles. Alevo appears to have acquired this core battery technology from a German startup called fortu PowerCell, which would explain why Alevo says it built the technology in German labs (but now is based in Switzerland). Fortu is described in Businessweek as having become a subsidiary of Alevo in May 2014. Fortu wanted to open a plant in Michigan but struggled. You can read about fortu’s original intellectual property here. Alevo says its other innovation is software that can efficiently run the batteries and provide services. 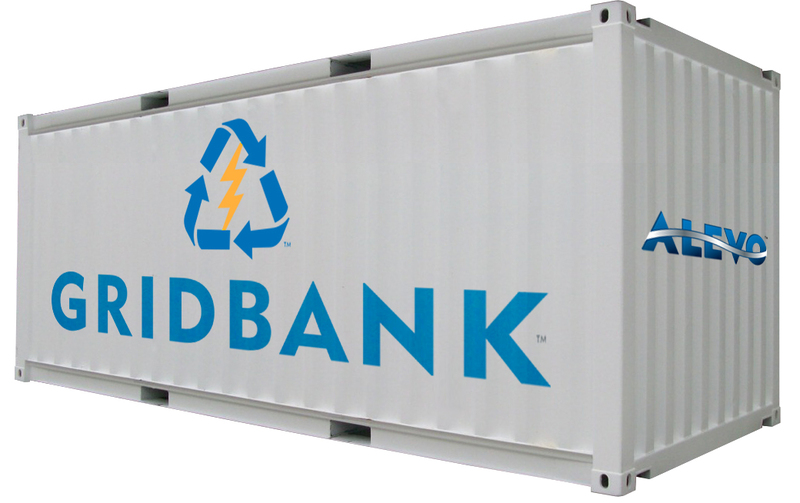 Alevo plans to package the batteries into containerized units and then sell the battery power. Alevo would operate the battery storage farms. To get these batteries to market, Alevo has spent $68.5 million to buy an old cigarette factory in Concord, North Carolina. It says with $1 billion of investment, it can eventually make several gigawatts worth of batteries from the factory per year. The company says it’s already spent over $100 million to get to where it is today. Alevo spokesman James Kennedy (who comes from an outside PR firm) said that so far the company has raised $350 million in private equity funding, but isn’t disclosing its investors. There’s some confusion about whether or not the company has already raised a billion dollars. Reuters said the company has already raised $1 billion from anonymous Swiss investors, but the Associated Press quoted Harrison Wellford, an adviser, who is helping Alevo raise the money it needs. Kennedy told me the rest of the $650 million will come from “funds being raised.” He also said Alevo isn’t seeking federal or state funds for its factory and the batteries won’t be made and shipped commercially at least until 2015. While the funding environment for new battery technologies seems to be better in 2014 than it was over the past few years, raising funding for early stage battery technologies is notoriously difficult. The discrepancy in reporting on the funding isn’t the only thing a little off about this story. In my conversations with battery industry competitors, energy investors and analysts, I couldn’t find anyone who was familiar with the company or its investors, beyond just having learned of them through the media launch. For such an aggressive plan from a ten-year-old project, you’d think someone outside of Alevo’s hired PR person would have more in-depth knowledge about this firm. The company’s CEO and chairman also seems controversial and unusual. Reuters noted that Norwegian entrepreneur Jostein Eikeland has had “a mixed record of success,” and his claim to fame is that he created a company called TeleComputing, which was an Application Service Provider (ASP) in the 1990s. Gigaom’s Barb Darrow described ASPs to me this way: they offered applications for rent, and Oracle and Microsoft recruited ASPs, many of which went out of business as the big vendors started to compete with them. Alevo’s PR company calls ASPs a pre-cursor to cloud computing, and the website that Alevo’s team built for Jostein Eikeland says, “Eikeland is known by some as the ‘Cloudfather. '” When I checked with cloud reporters at Gigaom and some other cloud industry followers I know, no one had previously heard of Eikeland or referred to him as the Cloudfather. But that could also be because he’s Norwegian and not a U.S. entrepreneur. Battery startup Alevo and their lab equipment. After founding TeleComputing, Reuters says Eikeland ran Swedish autoparts company TMG International, which went bankrupt in 2008. According to Alevo, Eikeland started his career in the music industry as a promoter and manager. There’s no mention of Eikeland having any previous battery manufacturing or energy industry experience. The fact that Alevo is projecting such a large volume of battery production (several gigawatts annually), as well as an aggressive ramp-up of employees — from 100 this year, to 500 next year, to 2,500 in three years, to potentially 6,000 — is unusual given the company hasn’t closed the funding to build the factory. Tesla has made similarly aggressive claims for its battery factory in Reno, Nevada, but it’s a public company, with a $27 billion market cap and a partner in Panasonic that has pledged hundreds of millions of dollars of investment. Those types of early aggressive claims are more in line with other startups that have since struggled, like electric car maker Fisker Automotive and electric vehicles infrastructure company Better Place. A lot of startups have underestimated how difficult it is to make new energy technologies at scale, particularly at the low cost needed to compete as a commodity. Navigant Research analyst Sam Jaffe noted to me that many companies “have claimed that they can make lithium iron phosphate batteries cheaply, but have found out the hard way that the manufacturing process is extremely difficult.” Jaffe said Alevo will likely have to prove the 40,000 cycle durability of its batteries before it starts convincing utilities to buy their product. It’s surprising that some publications aren’t taking a more skeptical look at the company. This article calls Alevo “a serious rival to Tesla in the race to achieve next-generation grid battery manufacturing at gigawatt scale.” Talk about putting the cart before the horse. Alevo might end up being the next big battery breakthrough company, but it’s clearly making a lot of claims at a pretty early stage in manufacturing. Updated on Wednesday, 8:22AM with information on fortu. NIMH “large format ” LF, Rules: the nickel metal hydride large format electric car battery that was underhandedly bought from GM who got it from the inventor of Shin ski, was bought by Texaco t boone Pickens Chevron, and suppressed for the last 15 years now finally it’s coming out of its hostage mode and will be public domain: in fact Toyota has already announced that it’s a hybrid Prius will offer buyers a choice of either nickel metal hydride large format or the lithium ion batteries, yay for the good side finally the suppressors have run out of gas so to speak! OTOH, Panasonic’s commitment to progress, e.g., solar panel production and deployment, the Tesla battery project – has them looking pretty happy in the market this morning. Very fishy indeed! The pictures trying to demonstrate the reality of the battery show standard shipping containers repainted with Alevo’s logo without any visible modification for cooling, power connectivity etc and a standard lab dry box…. Consulting company selected for analysis of the system has no battery related experience to support the commercially critical cycle-life claims guaranteed by an unnamed insurance company, technology scale-up from laboratory to a ready-to sell 2 MW units in 4 years with credible/guaranteed ability to provide of 40,000 cycles (>10 years of commercial cycling) on a commercial scale? Give me a break! Thank you Katie for your insightful analysis which confirmed my own suspicion. And by repainted with Alevo’s logo you mean clearly photoshopped. I live nearby and would love for big industries to come to town but like with Elio we can only hope for the best. Why use lithium in a battery for grid storage? Lithium’s advantage is light weight, useful for cars & portable electronics, but it has known longevity problems. For grid storage, weight is irrelevant. Sounds fishy. At the Alevo website – section Alevo Battery Technology (ABT) – a diagram shows the capacity over cycle count. The degradation to 80% capacity is reached after approx. 3000 cycles. I think this is not much better than other designs. For example the A123 AMP20 cell has 85% capacity left after 3000 100% DOD cycles. Thanks Katie for being the only skeptical report on this I’ve seen so far. There are some very strange pieces of this story, including the company claiming they’ve invested $100M in IT to build simulations. Seems absolutely crazy. We all know how many battery chemistry companies have been successful in the past 30 years. Ummm. None. Tesla succeeded because they used a proven, off the shelf chemistry.